I love thrillers or books billed as "can't put them down" and something about the description of this book really appealed to me. Over the holidays, I always feel low-key and take some extra time to relax and this book was perfect for that. I ended up with an extra day off or two and found myself quickly turning the pages of this book. 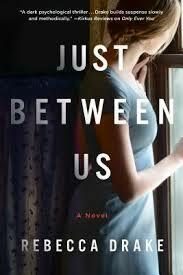 Just Between Us is primarily a thriller but it dips into some interesting themes, primarily that of female friendship. A friendship between four women makes this story possible. Without their closeness but also their petty insecurities and jealousies, the story wouldn't be possible. What would you do if you knew one of your best friends was being abused? How would you intervene? And to what lengths would you go to in order to support her when she attempts to defend herself? That's the situation the characters in this book find themselves in. I don't want to give away too much because this sort of book is best enjoyed with very little knowledge of the events that unfold. I will say, though, that it's kind of messy and you'll certainly feel at points that the character should have been a lot smarter. Even so, it was a great read, one I really enjoyed about growing paranoia and suspicion, friendship, secrets, and the reminder that people who commit criminal acts are not always that bright. It also challenges perception and how much we project our own histories onto the present.